BBC BIG BLOCK CHEVY 396 427 454 496 BILLET ALUMINUM WITH CHROME PLATED FINISH ALTERNATOR BRACKET. FOR USE ON ENGINES WITH A LONG WATER PUMP. 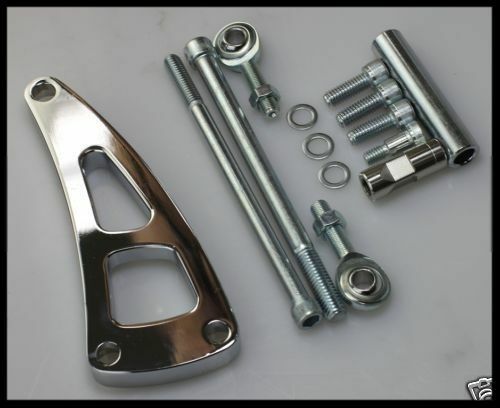 This alternator bracket kit is for BBC Chevy engines that have a LONG style water pump. Be sure of what style water pump you have before buying. This bracket will only work with engines using a long style water pump. The chrome plated finish over polished aluminum is very high quality. 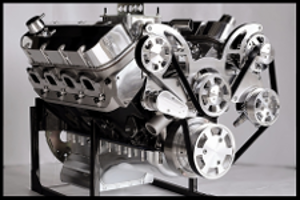 When mounted, it is sure to add more to the appearance of your engine than anything else. This assembly is first class. The price may seem a bit high, but you will see why when you receive it. Very well made, and extremely well finished. All made from solid billet aluminum. See our other listings. Be sure and check your belt alignment. The reason we mention this is that many water pumps and pulleys that are not original GM may have slight infractions to them. This is an easy fix, if you do notice it. You can shim pulleys, as well as the alt. bracket, or you can mill the boss pad on the water pump slightly, and you can also mill the bracket if needed with ease, or in some cases add a few washers in the location needed. No one has ever complained to this day, but that does not mean they are all running with true belt alignment. You can have a little variance in the belt alignment, but very little or you will eventually sling the belt. There are many ways to achieve better belt alignment. One thing for sure, the alt bracket we are selling is within spec. One more cause for misalignment of the belts is the fact that the block has been milled. This will cause the heads to sit in a slightly different position on the block, and as you know, the upper bolt on the alt. is attached to the head, and the lower bolt connects to the bracket coming from the water pump on the block. If the block is within oem specs, the heads may have been milled down, causing the same issue.